Fox takes over a program that won six Sunset League titles between 2006 and 2014. 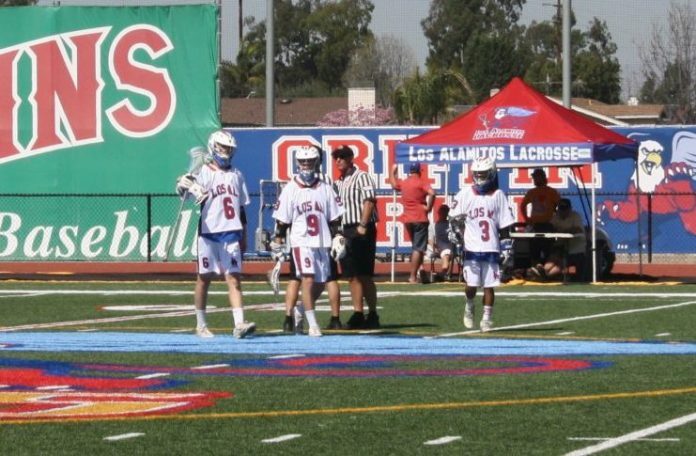 Tim Fox has been named the new head coach of the Los Alamitos High School boys’ lacrosse program. Fox brings nearly 15 years of coaching experience to the position. He began his coaching career as an assistant coach at Lincoln (Rhode Island) in 2002 before being promoted to the boys’ lacrosse head coach in 2006, a role he kept until 2009. He is currently the head coach at the University of California Irvine and Executive Director and coach at Beach Cities Youth Lacrosse. Prior to accepting the position at Los Al, Fox coached the Beach Burn varsity team in the Pacific Lacrosse League. Fox takes over a program that has routinely reached the playoffs and has a proud history that includes six Sunset League championships from 2008 through 2014. The Griffins have finished in second place behind Newport Harbor each of the last two years. Great selection and prices at Lacrosse Monkey! Shop here and help support MaxLax. Fox started playing lacrosse as a goalie in Long Island, New York when he was 12. He was captain of his Connetquot Hig School lacrosse team in 2000, leading his team to the quarterfinals in Suffolk County, NY. He played goalie for the Bryant University 2002 Eastern Collegiate Athletic Conference Championship team. Fox also served as assistant to the General Manager of the Long Island Lizards Major League Lacrosse team from 2001-2004. Fox coached the Lincoln (Rhode Island) High School team from 2002 until 2009, including a stint as head coach from 2006-2009. He received the Sportsmanship Award in 2008 from the Officials Association for the state of Rhode Island. Fox says that he is “Looking to shake things up a bit and start out by introducing a new culture to Los Al that I believe will help the program flourish in all areas. Our goals will be simple: work hard, work together, get better every day. I want Los Al players to walk off the field every game, Win or Lose, knowing that they played their very best. If not we’ll keep working hard to continue to improve every day throughout the season.